My artistic style is different, maybe a bit on the eclectic side. Everything I make is one-of-a-kind. I don't think there is anything that doesn't inspire me, but if I had to choose one thing it would be color. I love bright, bold colors. I love putting colors and objects together that generally would not go together. I like working with charms, buttons, found objects, and big beads. Just recently I started working with Swarovski crystal and found that I really enjoy it. 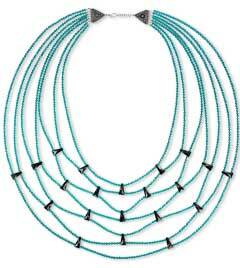 It's a modern adaptation of an Egyptian collar. This is probably the first design that I actually drew out before I did it. And in the end it came out nothing like I planned--it came out even better. I started making jewelry about 4-5 years ago. My mother does cross-stitch, and in one of her books it had beading projects and I fell in love with some of the jewelry and bags that were in the book. I thought that this was something that I could do, so I started out beading on a loom, and then progressed to some of the projects that were in my mom's magazines. As time went on, the creativity started to come out and I started to create my own jewelry designs. I'd have to say my mom because it was from her books that I got the idea to start beading and making jewelry. I have been in the cosmetology industry for about 15 years, 5 of which I was teaching at a beauty school. When it comes to doing hair, I am very artistic and creative, yet I can downplay that creativity when needed. I sang when I was younger, and was in many school competitions in which I have medals for. My grandmother taught me how to do plastic canvas when I was younger. My mother does cross-stitch, altered books, and embroidering (on her machine). I have done cross-stitch as well, but found that I really don't have the patience for it. On the internet searching for beads. I enjoy watching movies, reading, playing hidden object and match 3 computer games, and playing with my dog. I also recently started to do plastic canvas again. Although jewelry-making is a hobby, it plays a very important part in my life. Most people say not to do crafts and things when you are upset or stressed, but I beg to differ. That's sometimes when I do my best work. It is my stress relief, and it's a way for me to get out my frustrations or other unwanted feelings. The things I create when I am having a bad day are sometimes my most amazing pieces. I feel such relief and peace after a day of jewelry-making. Last year I raised about $260 for a local women's shelter by selling awareness bracelets I had made. When the devastating earthquakes happened in Haiti, I made bracelets and raised almost $200 to help send a former student back to Haiti to find his family (he had found out that only his brother had survived). Just go for it. Take what's in your head and put it out there. Don't be afraid to be different. View all of Deirdre's designs in the Gallery of Designs.